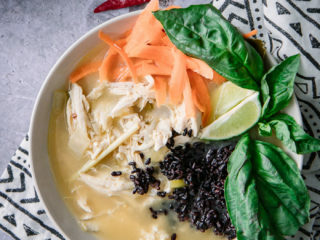 Thai Basil, Lemongrass, and Forbidden Rice Soup, a Thai-inspired spicy chicken and rice soup featuring galangal, thai basil, kaffir leaves, and lime. A big, bold, and flavorful dish! Heat oil in large soup pot or dutch oven on medium heat. Add onion, garlic, lemongrass roots and shells, galangal, ginger, and chilies. Cook 3-5 minutes, or until onion starts to soften. Add stock, fish sauce, lime juice, kaffir leaves, salt, and chicken breasts.. Bring to boil for a few minutes to release flavors, then reduce heat to simmer for 30 minutes. Remove galangal and hard lemongrass shells. Remove cooked chicken, allow to cool, then shred with fork and return to soup. Add precooked forbidden rice prior to serving. Rice will release color and blacken soup if added before cooking. Top with basil leaves and carrots, and enjoy! Leftovers & Storage: This Thai Basil, Lemongrass, and Forbidden Rice Soup can be stored in the refrigerator for up to five days, and in fact the flavors get better with time and the soup is even more delicious on the second day.